No matter what kind of tile you're removing, there is a biodegradable tile adhesive remover out there to ensure you get the job done without releasing any harmful chemicals into the environment. There are many times when a tile adhesive remover is needed in the home. Whether you're replacing a floor, salvaging some tile to recycle or just cleaning up a mess, adhesive removers are a must. A tile adhesive remover softens the adhesive by breaking down its chemical compounds so it's easy to scrape or wipe off. There are several kinds of adhesives used today, each of which will require a different adhesive remover. Organic mastic is one of the oldest tile adhesives still in use today. It is also the easiest to remove. In fact, the most biodegradable tile adhesive remover of them all is used to clean up old mastic: water. Organic mastic will soften and break down in water. No chemicals are used in its make-up, so no chemicals are released during its removal. In fact, organic mastic is one of the greenest building products on the market today. Thin-set mortars are made of Portland cement and are much harder to remove. In fact, if you're salvaging the tiles for recycling purposes, you may wish to grind the cement off, rather than use an adhesive. If this is too time consuming, you can use an eco-friendly adhesive remover to soften and then scrape off the cement. Epoxy mortars are most frequently used with marble and other stone tiles, especially in outdoor use or where there is a lot of water use such as in bathrooms and kitchens. You will need an adhesive remover to break this compound down, since epoxy is one of the hardest chemical compounds used today. There are multiple types of vinyl tile adhesive in use today. Most of them will soften when heat is applied, allowing you to scrape off the adhesive without a remover. Luckily there are also several vinyl tile adhesive removers that are biodegradable, letting you get a clean job without a lot of heavy scraping work. Just be sure that your vinyl tiles do not contain asbestos adhesives before you begin so you can be certain that you aren't releasing asbestos fibers into the air. You can see that adhesive removers are geared toward the type of tile or adhesive you are working with. Many adhesive removers are multi-purpose, meaning they will break down a number of compounds. If you aren't sure what kind of adhesive was used in the tile work, give plain water a try first. If this doesn't work, then try a multi-purpose remover. Krud Kutter also works well on vinyl tiles, as well as linoleum and laminates. Not only does Sentinel 626 work on vinyl, it also removes adhesives containing latex. You can use this adhesive for removing the mortar from glass tiles, marble tiles and some porcelain and ceramic tiles. HydroClean is one of the safest adhesive removers on the market. It works to soften most tile adhesives, and is food grade safe, meaning you can use it in your kitchen without fear of contaminating other surfaces. Like the others, it is also completely biodegradable. Attitude product removes all vinyl tile adhesives and glues, and helps to break down mastic faster than water alone. Completely non-toxic and biodegradable, Attitude is safe in any area of the home. 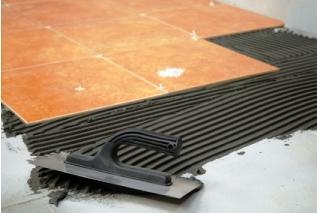 Finding the right biodegradable tile adhesive remover will depend on the kind of tile used. Remember that you can also grind down most cements to avoid the use of chemicals, and that heat will soften most vinyl adhesives. With the right adhesive remover, you can make sure that your green building materials stay green from start to finish.